A very warm welcome to you all to the Chinese Embassy! I shall follow your own practice and, for ease of speaking, call you the APPCG. It is a real pleasure for me to have the APPCG in the Chinese Embassy this evening. I am hosting this dinner for you for two reasons. First, I want to welcome all the new Office Holders of the APPCG following your elections last year. I expressed my congratulations to Chairman Graham through correspondence and in person. However, I have not yet personally congratulated other new Office Holders. So, tonight is an occasion of belated felicitations. Late as it is, as an English saying goes: “Better late than never!”. My second reason for inviting you this evening is that we have just ushered in a new year. I want to take this opportunity to extend to you my new year greetings. In particular, we will soon be celebrating Chinese New Year which brings us into the ‘Year of the Snake’. In Chinese culture, the snake symbolises health, fortune and prosperity. So I wish you successful careers and happy life in the ‘Year of the Snake’! Sixteen years have passed since the APPCG was created in 1997. This was when Hong Kong was returned to China. Relations between China and UK have in total spanned over two centuries. However, these past 16 years can be described as the ‘golden age’ of our relations. Of course these 16 years have not all been ‘plain sailing’, as the English saying goes. There have been some ‘ups’ and ‘downs’, but overall our relations have very much been on the ‘up’ and kept moving forward. During these 16 years, the APPCG played a big role in the growth of positive relations between our countries. I think it is of special importance how you have built up and maintained regular exchanges with the China-UK Friendship Group of China’s National People’s Congress. Also, I highly appreciate how APPCG have cooperated closely with the Chinese Embassy here in London. While advancing China-UK relations, APPCG itself has made great headway. I understand that APPCG has become the second largest country group in the British Parliament. Sixteen years on since the foundation of APPCG much has changed in the world. Indeed, much has also changed in China. Yet, our mission remains unchanged. At the start of a new year it is traditional to make fresh commitments. My Embassy, as we have always been, is ready to strengthen exchanges and cooperation with the APPCG and fulfill our shared mission. I hope this renewal of commitment will provide the new leadership of the APPCG with encouragement for their efforts, in the months and years ahead. As we move forward together, I believe we should work toward these three ‘shared goals’. 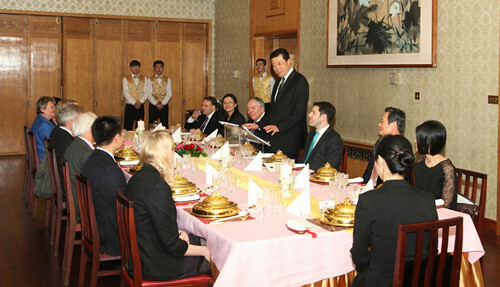 First, work together for long-term stable and healthy development of China-UK relations. A closer China-UK relationship serves the fundamental interests of our two countries and our two peoples. The recently convened 18th Congress of the Chinese Communist Party made it clear that China would improve relations with developed countries and foster a new type of relations with major countries. This of course includes relations with Britain. 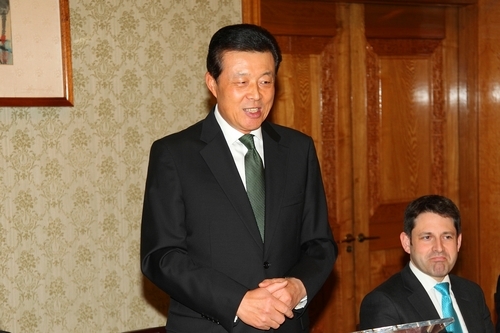 · and provide a solid underpinning for the comprehensive development of China-UK relations. The second shared goal is that we work together to increase dialogue and exchanges between our legislatures. Parliament is Britain’s political nerve centre. The National People’s Congress is the supreme body of power in China. Both are at the apex of our political structures. The APPCG from the British parliament and the NPC’s China-UK Friendship Group are the implementers of our parliamentary exchanges. So your dialogue is at the top level. Your cooperation proposals have an influence that reaches deep into both our government structures. This gives the APPCG an irreplaceable role in our relations. The third shared goal is to work together for better knowledge and understanding of each other across all social sectors. Today’s China pursues a path of socialism with Chinese characteristics. It practices a theory and a system of socialism with Chinese characteristics. Some people in the West, including those in Britain, lack knowledge about China’s system and development path. Some of them do not bother to know, still less to understand. But knowledge and understanding of each other is a foundation for developing state-to-state relations. The APPCG is a group of leading British politicians with the power to sway understanding in the UK. I hope you will pioneer an objective perspective about today’s China. I also hope that your influence and leverage will find their way into all sectors of British society. In this way you can help British people to view China in a reasonable and objective way. To the continued progress of China-UK relations. To the continued growth of the APPCG. And to the health and good luck of all present!